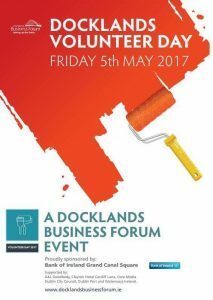 Over 220 volunteers participated in the 2017 Docklands Volunteer Day. Participating companies included our principle sponsor Bank of Ireland and A&L Goodbody, Accenture, IPB Insurance, Core Media, Glandore, Aspira, Central Bank, Convention Centre Dublin, Owen Reilly, Gibson Hotel, Dublin City FM, Mail Boxes Etc, Clayton Hotel Cardiff Lane, Waterways Ireland, Dublin City Council, Bilfinger Real Estate, Inland Waterways Association of Ireland, IDEA, McElhinney & Co., CBRE and Cloake. We improved on our annual themes of cleaning, painting and planting this year in a number of ways. 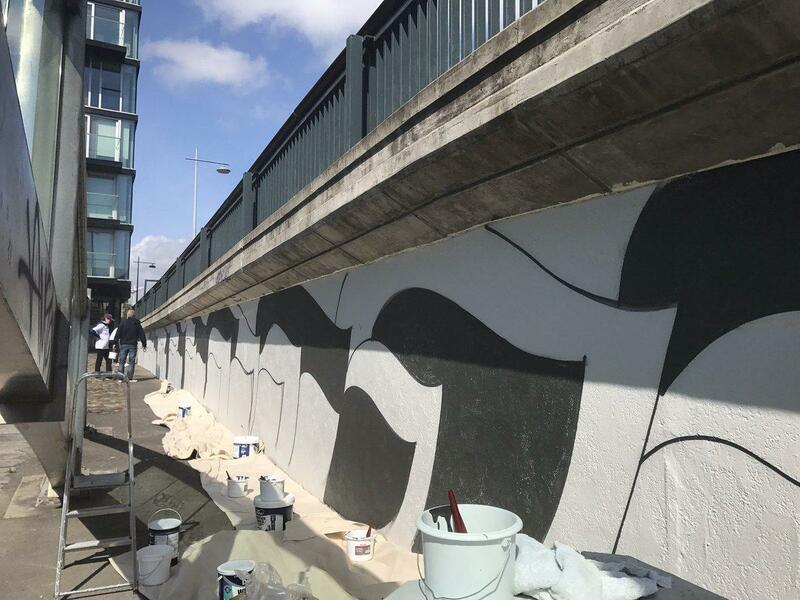 Painting the McMahon Bridge has become an annual response from the Docklands Business Forum to the Graffiti that accumulates over the previous twelve months. To create a more sustainable solution we partnered with Patrick Gorman Senior Executive Engineer at Dublin City Council and artist Dan Irwin to create a mural appropriate to the maritime and architectural surroundings and one that may deter further graffiti. The week before the volunteer day Dan painted an outline of the agreed abstract waves on the bridge. The chosen colours of anthracite grey, silver and white were considered complementary to the surrounding architecture. We are very grateful to Patrick Gorman at DCC for his support with paint and materials and also the time he spent advising us and participating in the planning and decision-making process. Bank of Ireland was our principal sponsor for the day and one of the local Bank Managers, Morgan O’Regan, led the team painting at the McMahon Bridge. 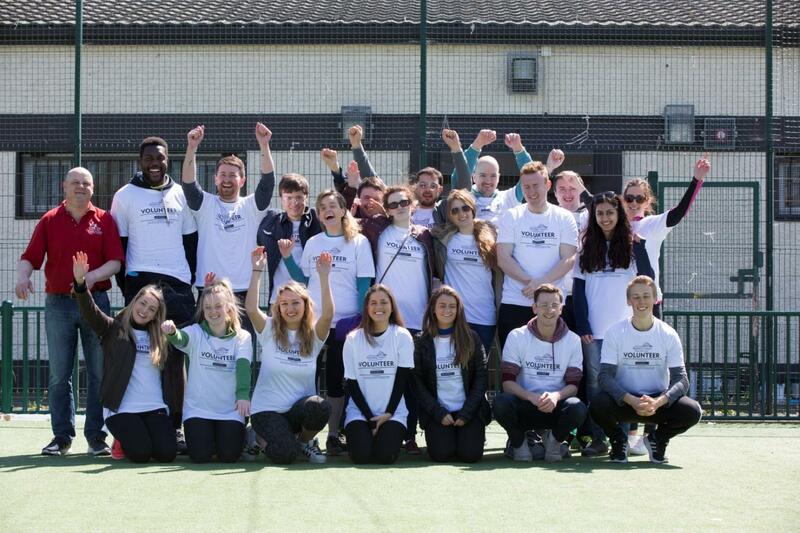 We were delighted Marcelo De Stefano from the Grand Canal Dock Residents Association joined this team for the day. Arthur Farrell Principal, Enable Ireland School Sandymount. Local businesses and organisations gave very generously including our principle sponsor Bank of Ireland and A&L Goodbody, Clayton Hotel Cardiff Lane, Core Media, Spenser Dock, the Marker Hotel, Dublin City Council, Bilfinger Real Estate, Waterways Ireland and Dublin Port. Others provided prizes for our social media competition including Milano Grand Canal, KC Peaches Pearse Street, Herb Street, the Gibson and Grand Canal Hotels. Special mention here should go to Conor O’Kane and his team in the Clayton Hotel on Cardiff Lane for generously providing a three-course buffet lunch for all our volunteers. It was an ideal opportunity for all the teams to get together during the day and share experiences. Another successful development this year was our reach out to the local community. Sinéad Smith the Corporate Responsibility Manager from A&L Goodbody was the driving force in this initiative. Our largest community project was painting the playground railing at the East Wall Community Centre. The team leaders were Bríd Ní Chuinn and Denis Wickstone both from A&L Goodbody. As there is a full-sized basketball pitch within the East Wall Playground we were delighted to team up with the East Wall Man Shed to get this job done. Throughout the day many local children came over to thank our volunteers and this really did add to the day’s sense of accomplishment. We hope next year to deepen our relationships between local businesses and the local communities. Such communications can only have a positive effect on this area of Dublin’s inner city. We also reached out to the Bath Avenue and District Residents Association and with the help of their chairperson Joe McCann we were able to do some garden clearing for elderly people in the area and also prepare a garden for children at the Enable School in Sandymount. Local Docklands resident and Estate Agent Owen Reilly lead the team at the Gardens and Jeri Mahon from Glandore led the team at Enable School in Sandymount. Wall Quay great assistance with plants, equipment and advice. 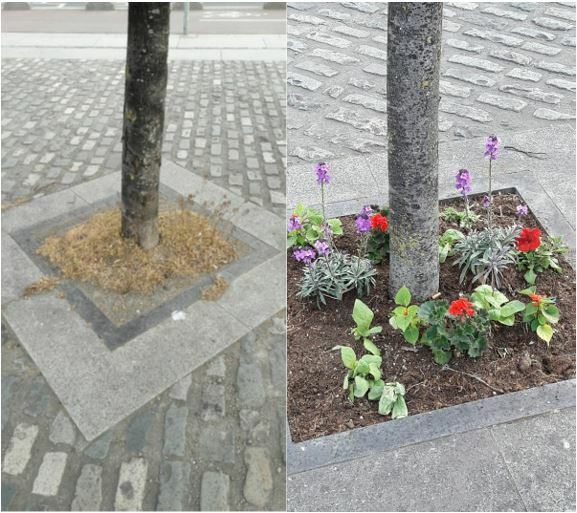 With the extra flowers provided the team continued throughout the day to plant all the populated tree pits which provided a vista of bright colours all along the stretch of North Wall Quay in front of the Convention Centre Dublin and PwC. Audrey Mitton and our friends in Bilfinger Real Estate gave us their team for the day and this proved invaluable assistance in removing large sections of Graffiti in Docklands north and south. 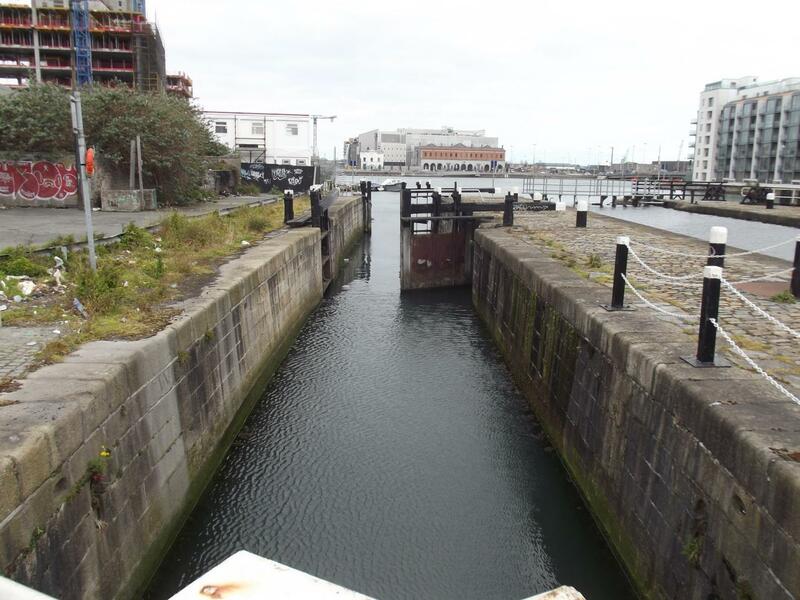 Other tasks for the day included clearing the flotsam from the Grand Canal Basin and Royal Canal at Spenser Dock, emptying the rubbish from the Westmoreland Lock Gate including a vacuum cleaner, a trolley and a number of bikes. 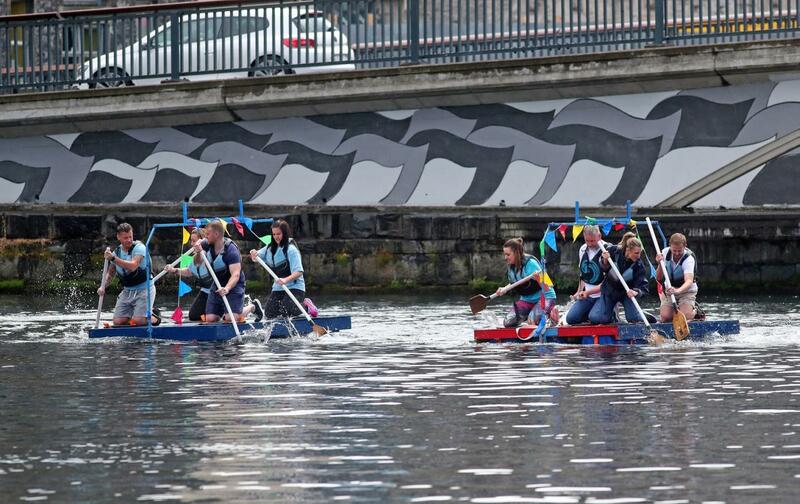 This team was lead by Forum Chairperson Michael Noel Harte of Mail Boxes Etc and ably assisted by Benny Cullen from Waterways Ireland and the ladies from the Plurabelle Paddlers. Dockland businesses and employees are delighted to be located in this vibrant area of the city and are proud of the key role business has played in the success of this urban regeneration. 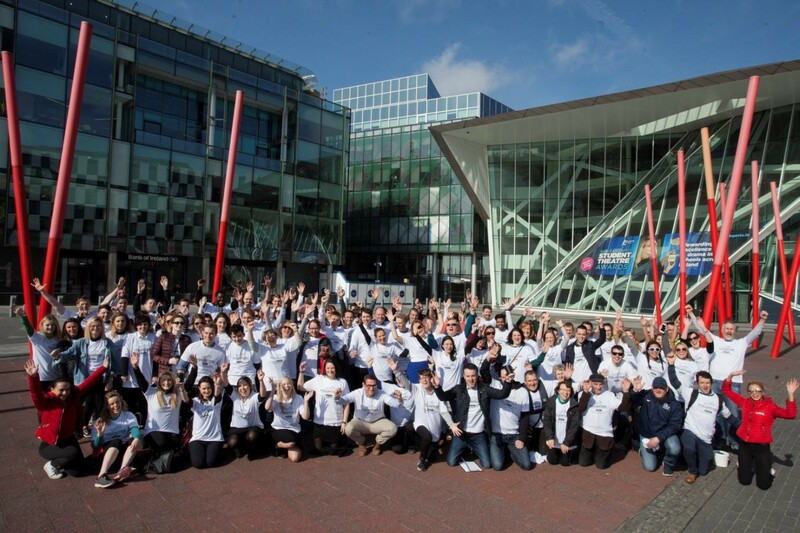 The Docklands Volunteer Day brings local businesses and communities together in the common cause of taking some responsibility for our local environment and expressing an interest and concern for our local area. Such connections, particularly between young employees and young people from the Dublin’s inner city, can only have a positive impact on the future of our city.